THE STORY - A primatologist named Davis Okoye (Dwayne Johnson), is someone who keeps people at a distance but shares an unshakable bond with George, the extraordinarily intelligent, incredibly rare albino silverback gorilla who has been in his care since he rescued the young orphan from poachers. But a rogue genetic experiment gone awry mutates this gentle ape into a raging creature of enormous size. To make matters worse, it’s soon discovered there are other similarly altered animals. As these newly created alpha predators tear across North America, destroying everything in their path, Okoye teams with discredited geneticist Kate Caldwell (Naomie Harris) to secure an antidote, fighting his way through an ever-changing battlefield, not only to halt a global catastrophe but to save the fearsome creature that was once his friend. THE GOOD - Has immense destruction and agility to uphold an audience as a popcorn film. Dwayne Johnson is charismatic and committed, which works in the grand scheme of things. ​​​As soon as we see the rapid growth and beastly hunger of a gorilla overnight, we know The Rock is in trouble. 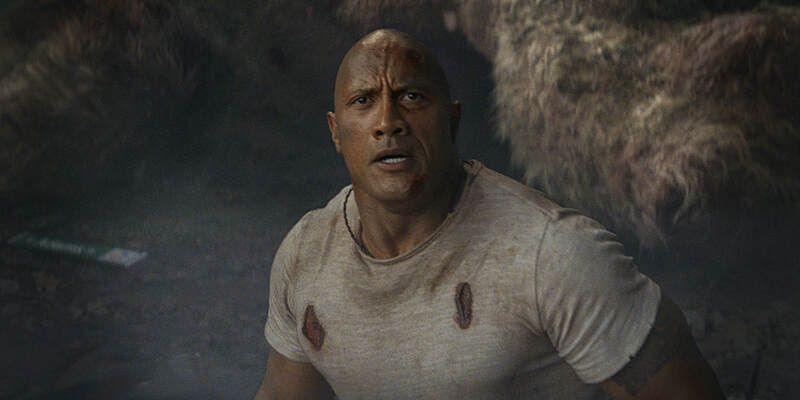 In Brad Peyton’s latest disaster film, we are getting just that, Dwayne Johnson running around through gargantuan mutated beasts trying to save Chicago from destruction. With a bland script and even more questionable plot holes, “Rampage” does its best when it focuses on its absurdity. There’s some credit to give here, as Johnson has become so lovable of a performer while carrying that charisma into a film whose action is almost entirely CGI. In this modern take on the classic eighties arcade game, ‘Big meets Bigger’ and brainless entertainment definitely sees its way through here. Johnson is Davis Okoye, a primatologist with a deep affection for animals over mundane human relationships. In his military career and wildlife background, he’s never perceived people to be any more than selfish weasels who would even kill animals for profit gain; people who would do unjust things to get what they wanted. For that reason alone, his devotion and time are handed to caring for animals. George is an albino gorilla at the San Diego sanctuary that Davis rescued from poachers at birth. The best of friends, these two communicate so well by way of sign language, dark humor, and crude gestures. When a rogue genetic chemical falls as meteors from the sky, three animals, George included, are exposed to the gas pathogen and their DNA is altered to massive proportions. The genetic experiment, produced under the science company Energyne by a discredited engineer, Dr. Kate Caldwell (A sweet but underused Naomi Harris), has an antidote somewhere and Davis and Kate intend to find it in time before inevitable demolition. Jeffrey Dean Morgan brings a southern gentlemen silliness to his role as the government official who just keeps saying the same thing over and over, but sure, he’ll get a pass. With the Wyden siblings (Malin Akerman and Jake Lacy) behind all the mess, they attempt to wreak havoc on the city in turn for gain, but they are so disposable and cartoonish that they never find their footing in the film. Their characters could have vanished and we wouldn’t have noticed, with all the lunacy running around happening. The film mainly suffers in underdeveloped relationships and plot holes. Davis, although a recluse to people in general, had three friends/colleagues in the beginning who were amusing, but completely shut out into the runtime. An easily digestible two hours, it doesn’t ask for much to enjoy. Dwayne ‘The Rock’ Johnson (When you’ve seen him your whole childhood, he will always be The Rock to you, ok?) pretty much carries the film alongside his gorilla companion, culminating to fun action sequences and a realized bond. Johnson fits the bill for the likable protagonist in almost everything. Destruction suits him. For a PG-13 film, “Rampage” surely has the death count up while also never failing to drop a few s**t’s. What else could you expect from seeing giant animals demolish your city? It’s on the brink of masterful monster destruction. Somehow, we love seeing these huge animals blast through urban Chicago wrecking buildings and keeping Davis on the edge. The visual effects, while sometimes shoddy, allow George to come alive and be his valiant self at full force. Loosely based on the series of video games of the same name, “Rampage” does enough rampaging to at least establish itself into a laughable popcorn movie. The series of games from the 1980’s had a premise where genetic experiments were being conducted on humans, resulting in scathing mutations into large, maniacal creatures that demolish everything in sight. Quite the fun, the games featured the trio of George, Lizzie, and Ralph— the gorilla, the reptile, and the wolf— the characters of mayhem we see in the film as well. If they had translated just that onto the big screen, it would be a complete narrative failure. Instead, there’s something to fight for here: the civilians of Chicago and more importantly, George. Davis wants to bring the gentle giant back from Godzilla-like escapism. It’s the mold of the film. “Rampage” at that level, passes for easy fun that doesn’t ask much of the viewer.